The painting, the Le Pont de Trinquetaille by Vincent Van Gogh, was bought for $20.4 million at an auction in London, England. LONDON — Dutch-born artist Vincent van Gogh’s “The Bridge at Trinquetaille” was sold at auction Monday for the equivalent of $20.2 million, the second-highest price ever paid for a painting. The winning bid in the sale at Christie’s auction house that took just over one minute came in a telephone call from an unidentified German-speaking collector in Europe. The bidding–in British pounds–was raised in increments equivalent to $800,000. The total price includes a 10% commission charged to the buyer. Last March in London, Van Gogh’s dazzling yellow painting called “Sunflowers” became the most expensive auctioned picture when a Japanese firm, Yasuda Fire & Marine Insurance Co., paid $39.9 million for the painting. “Le Pont de Trinquetaille,” portrays an iron bridge that spans the Rhone River in southern France between Arles and its suburb of Trinquetaille. It was painted in a single afternoon in 1888–less than two years before its impoverished creator committed suicide at the age of 37. Van Gogh thought it might be worth $100, according to Christie’s Impressionist expert, James Roundell. The painting was sent for sale by an American, Sonja Kramarsky, of New York, a descendant of Siegfried Kramarsky of Amsterdam who bought it at a Paris sale in 1932 for about $18,000. The entire Kramarsky collection, including the Van Gogh bridge, was sent from Holland to the United States for safekeeping just before World War II. For the past three years, the painting had been on loan to New York’s Metropolitan Museum of Art. 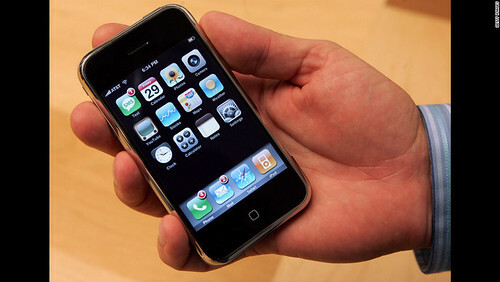 Apple Inc releases the first iPhone. Ninety-nine people are killed in train crash near St-Hilaire, Quebec. The Space Shuttle program Atlantis docks with the Russian space station Mir for the first time. Two bombs are found in cars at Piccadilly Circus in London.